There have been many notable fusions of jazz and South Asian musical forms over the years, such as Buddy Rich’s percussion duets with Alla Rakha and the Indo-Jazz Fusion double quintet co-led by Joe Harriott and John Mayer. However, the impetus for such explorations typically started on the jazz side. The traditional musicians of Pakistan’s Sachal Studios are a different case entirely. They decided to experiment with jazz forms and they did it at a time when simply being a musician could get them killed in Islamist Pakistan. 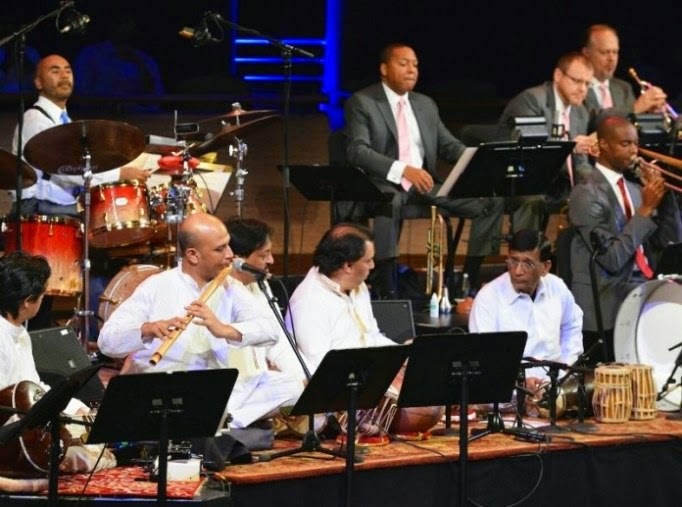 Sharmeen Obaid-Chinoy & Andy Schocken chronicle their unlikely collaboration with Wynton Marsalis and the Jazz at Lincoln Center Orchestra in Song of Lahore, which screens during the 2015 Tribeca Film Festival. In Taliban infested Pakistan, culture of any sort is largely prohibited. It was not always so. The Sachal Studio musicians represent a long line of artists, stretching back to the time when Lahore was a renowned center of music. Things were bad under the Zia regime, improved somewhat after his fall, but became even more dangerous in recent years. Identifying the need for a safe creative outlet, Izzat Majeed secretly opened Sachar Studios. Finally, Pakistani musicians had a place to play together. With their chops rebounding, Majeed challenges them to tackle American style jazz, hoping it will broaden their potential base of listeners. The idea that the commercial popularity of jazz looks enviable to Pakistani musicians is a pretty depressing thought. Nevertheless there are kinships between the two musical traditions, most notably the improvisational ethos. Of course, one of the bestselling jazz records of all time was Dave Brubeck’s Time Out, featuring his classic rendition of “Take Five.” When the Sachar Studio posts a video of the ambitious arrangement of “Take Five” on youtube, its viral appeal quickly surpasses their expectations. Soon, they are invited to play a special concert at Jazz at Lincoln Center. However, melding the two ensembles will be a tricky proposition. Wow, it is simultaneously inspiring and horrifying to see musicians risking everything to play jazz. Indeed, Song leaves little doubt jazz is the music of freedom, giving a deserved shout out to the U.S. State Department’s Jazz Ambassadors program of the 1960s. Longtime fans and patrons will also find it cool to see J@LC mainstays like Ron Westray, Victor Goines, Ryan Kisor, and Joe Temperley on the big screen. However, not to be pedantic, but the frequent references to “Dave Brubeck’s Take Five” get a little irksome. Actually, Paul Desmond, a longtime Brubeck band-member and leader in his own right, composed “Take Five” and his alto solo (along with Joe Morello’s classic drum solo) helped make it so enduringly popular. Regardless, Obaid-Chinoy & Schocken show a fine general understanding of the music and appreciate it enough to let us hear some of the performances in their entirety. Ellington’s “Limbo Jazz” is an especially hospitable vehicle for the combined group’s improvisations. Song of Lahore does something that is almost impossible. It gives viewers a faint glimmer of hope for the future of Pakistan. It also features some wonderfully swinging and sophisticated music. 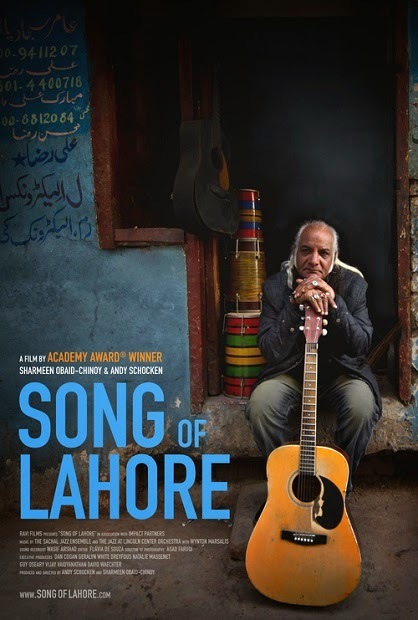 Highly recommended, Song of Lahore screens again today (4/23), as part of this year’s Tribeca Film Festival.